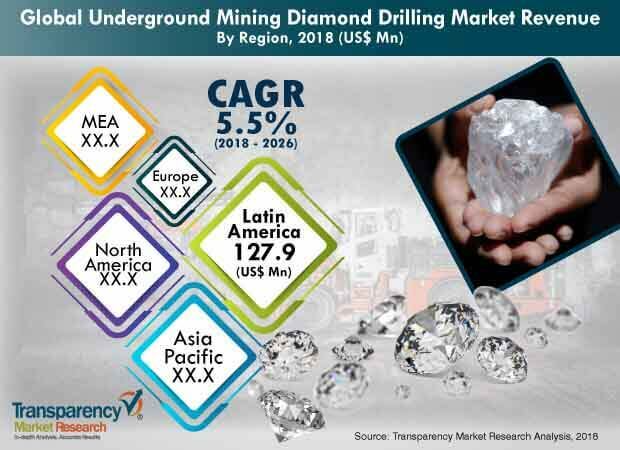 The global underground mining diamond drilling market was valued at US$ 423.4 Mn in 2017 and is anticipated to expand at a CAGR of more than 5.5% from 2018 to 2026 according to a new report titled ‘Underground Mining Diamond Drilling Market - Global Industry Analysis, Size, Share, Growth, Trends, and Forecast, 2018–2026’ by Transparency Market Research (TMR). Underground mining diamond drilling consists of diamond core drill bits, which are equipped with drilling systems such as rotary or wireline drilling systems. Deployment of efficient coring drilling rigs in the exploration phase entails substantial capital investment. Mining companies invest significantly in installation and testing of mined samples through coring systems. Based on type, the wireline drilling segment dominated the market in 2017. Wireline core drilling systems are used to drill medium to ultra-deep boreholes. These systems provide the most efficient core sample extraction from rock mass without pulling the entire drill string. The rock sample is removed from the bottom of the hole in the inner tube assembly by an overshot on a wireline cable. Wireline coring provides accurate results compared to rotary drilling. It allows rapid placement and withdrawal of the core barrel within the drill rods. Therefore, rods do not need to be removed to recover each individual core sample. Rotary drilling consists of conventional underground core drilling systems, which are less accurate than wireline drilling systems. Rise in demand for efficient coring solutions in the exploration of mining samples is expected to drive the demand for wireline drilling in North America in the next few years. Increase in demand for underground mining equipment and services is anticipated to boost the demand for efficient and accurate coring systems such as wireline drilling. The order intake for underground mining diamond drilling equipment such as wireline drilling has increased across the globe due to the constant demand for these drilling solutions among underground mine operators. Based on application, the hard rock segment dominated the global underground mining diamond drilling market with more than 85% share in terms of value in 2017. Majority of metamorphic and igneous rocks constitute hard rock. Gold, diamond, copper, silver, zinc, and nickel deposits are found in igneous or metamorphic rocks, which are relatively hard. Hard rock mines include most metal and diamond mines. They tend to be deep. The ore body is often steeply inclined (or dipping). Shafts can be as deep as several kilometers. Rise in investment in hard rock underground mines is expected to boost the demand for diamond core bits in the next few years. Currently, Australia dominates the underground mining diamond drilling market in Asia Pacific. The market in the country is expected to expand at a rapid pace, owing to large number of mining exploration contracts expected to be signed by 2019. In June 2018, Swick Mining Services was chosen as contractor for two underground mines projects in Australia: the Jundee gold mines and Renison Bell tin mine. The initial scope of work is for approximately 712,000 meter of underground core over two years requiring potentially 12 drill rigs in the first year and increasing to a potential 15 drill rigs in the second year of the contract (i.e. 2019). Rise in demand for underground mining equipment and services is projected to propel the underground mining diamond drilling market in Australia in the near future. The U.S. dominated the underground mining diamond drilling market in North America in 2017. Several players in North America supply core drill bits as well as complete drill rigs solutions. These include SCS Diamond Drilling, Peak Drilling Ltd., and American Diamond Tool. The market in Canada is expected to expand at a rapid pace in the near future. The Star-Orion South Diamond Project pilot hole core drilling was completed in December 2017. Shore and Rio Tinto Exploration Canada Inc. completed an HQ core drilling program, consisting of 10 holes and about 2,409 meters of drilling, on the Star Kimberlite. In total, 1,210 meters of kimberlite were intersected. Asia Pacific is estimated to provide lucrative opportunities to the underground mining diamond drilling market in the near future due to the rise in demand for steel and increase in mining activities in China and India.